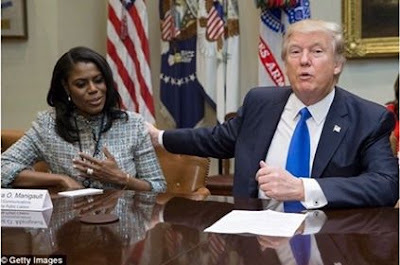 Former White House aide, Omarosa Manigault-Newman, who is now starring in Celebrity Big Brother, is contemplating writing a tell-all book but she fears President Donald Trump will come after her with everything. According to Mail Online, she made this know during the newest episode of 'Celebrity Big Brother' where she also discussed the end of her tenure as the Office of Public Liaison's director of communications at the White House. 'I'm emancipated. I feel like I just got freed off a plantation. Hallelujah. Thank you, Jesus,' she said in a clip that was filmed on her sixth day in the house. 'I was literally the only African American woman in the senior staff,' she said. 'So I'll probably end up in court for the next…but I have to tell my truth. I'm tired of being muted. All the stuff that I just put on a shelf somewhere out of loyalty. 'I've been defending somebody for so long, and I'm now I'm like: "Yo, you are a special kind of f****d up, and that special breed, they're about to learn all about it",' she continued.